LONG POST WARNING! BUT IT’S GOOD, SO CONTINUE READING…ALL THE WAY UNTIL THE END. PLEASE. AND THANK YOU! I know I promised a post about Amanda and I will post about her, trust me. 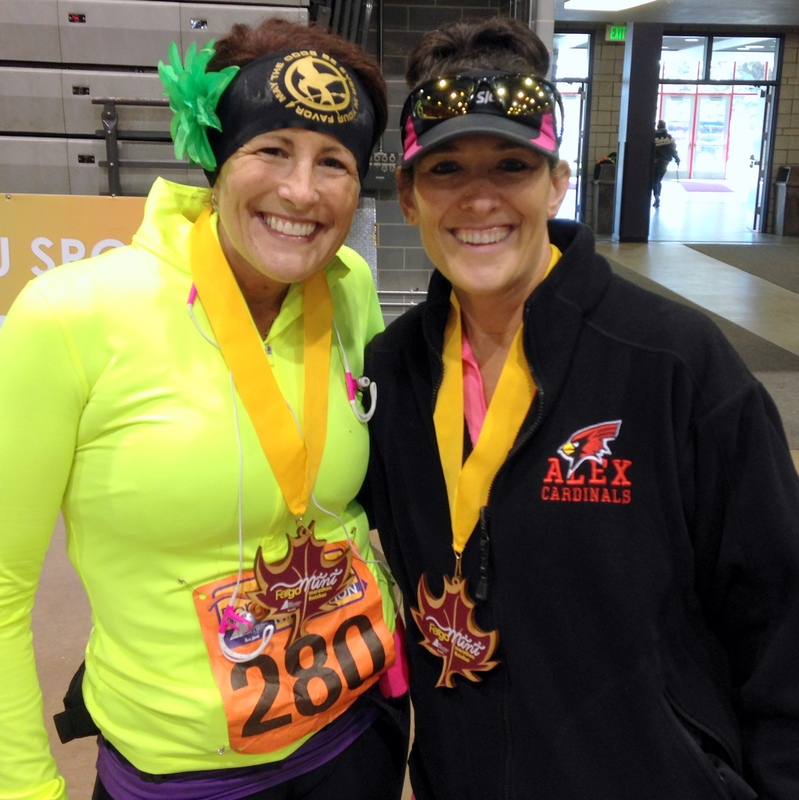 But, I thought I would first update everyone on my race attempt this past Saturday. If you don’t know, I am struggling with some foot issues right now. Read my last post to find out more. CLICK HERE! 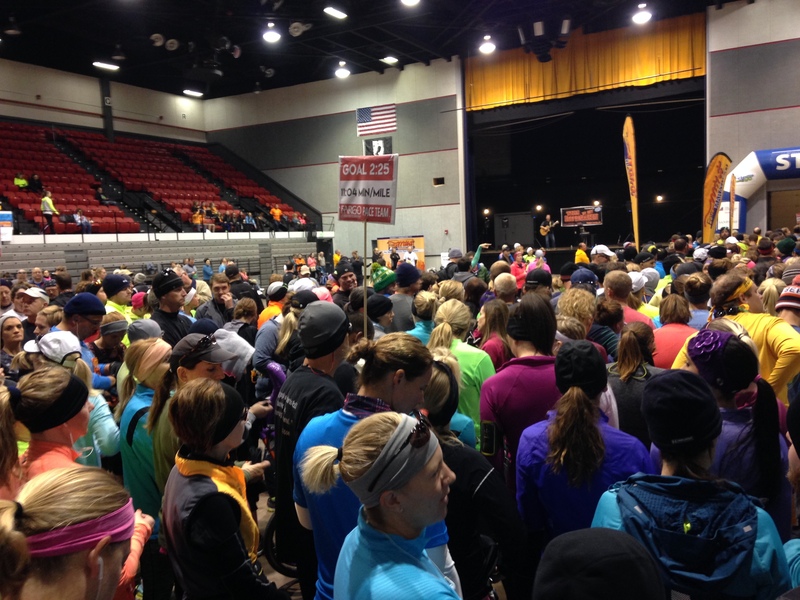 PHOTO: Waiting in line inside the Fargo Civic Center – decided to line up with the 2:25 pacer. First off, did you notice I used the word attempt? Going into this race, because of my foot issues, I knew there was a chance I wasn’t going to finish. I was prepared for that. Or at least I thought I was prepared for that. It was a cold morning – less than 30ºF out. It was an inside start, which was nice. Unless you have asthma. Going from breathing in the nice and toasty warm air to quickly breathing in the chilly not so toasty air does a number on your lungs and trying to breathe. I have to admit, my asthma has been acting up AGAIN. This time, I am guessing it’s the quick change in temperatures we’ve been having. Hot, cold, warm, colder, really cold. It’s fall in Minnesota, so we’ve been all over the board, which is not good for an asthmatic. Anyway, because my asthma has been acting up, I made sure to do a nebulizer treatment before we left for the race. I was prepared. Or so I thought. I was very fortunate to have remembered to bring my inhaler along – just in case I needed it. And boy, did I need it. 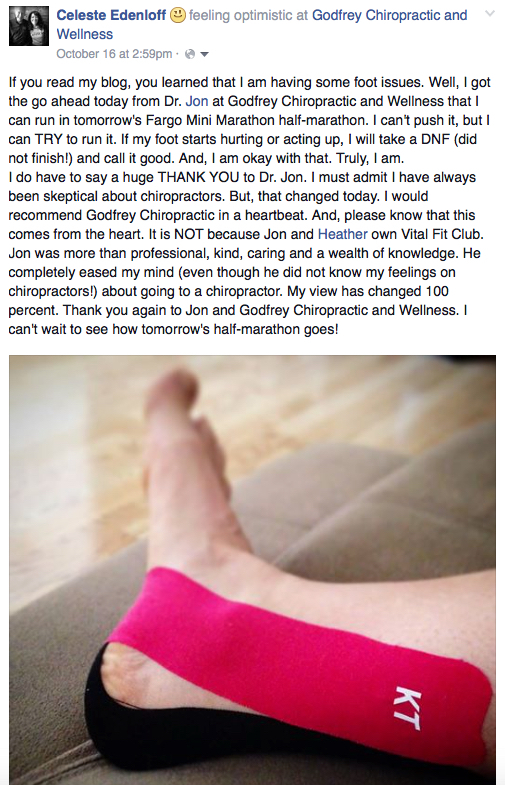 PHOTO: My Facebook post with my taped up foot. Love KT Tape. I was surprised at how good my foot felt. I was also surprised at how not good my breathing was. It was horrible. I had to stop even before I hit the first mile marker to take a couple hits from my inhaler. And for the first time, I had to step off the course to do so. This isn’t the first time I’ve had to use my inhaler while running, but that’s the thing, I can usually do it WHILE I am running. Not this time. I had to stop, catch my breath and then use the inhaler. My lungs felt horrid. Cold. Heavy. Like a hippopotamus was sitting on them. Like I was trying to breathe through a straw – a super skinny straw – a stir stick, if you will. It sucked. Well, I was sucking air. I tried to remain calm. Slowed down a bit, so I could catch my breath. It started to get better, or so I thought. I ended up stopping again – twice. I made a quick stop shortly after mile two and then a little bit longer stop shortly after mile three. For a short while, I forgot all about my foot – and the pain that was developing in my right knee – and focused solely on my breathing. The first couple of miles on my feet were good, great in fact. It was around mile three that not only was my breathing sucky, so was my foot. I was a hurting unit. In bad shape. I knew deep down that there would be no way I was going to run or even walk for that matter 13.1 miles. It just wasn’t going to happen. It just wasn’t my day or time. By mile four, the pain in my foot AND in my knee were increasing; not excruciating pain, mind you, but a very uncomfortable pain that I knew would only get worse if I kept going. PHOTO: Miles one and two weren’t so bad, although maybe, just maybe if I hadn’t started out so fast – well, fast for me – I could have kept going. MAYBE! I started watching for an aid station or water station where I knew there would be volunteers and they could help me get back to the Civic Center so I could wait it out for Al in the warm, inside air, off of my feet. Up ahead, through the trees, I spotted an ambulance, which I thought was going to be an aid station. And, I knew then I would be cutting my run short. As I slowly approached the spot where it was parked, I also noticed a police vehicle was parked there, as well. And I also noticed it was not an aid or water station, but that they were just parked there keeping an eye out on the runners. Like I said earlier, I was prepared to quit. Or so I thought. The second I stopped running and took that first step off the course and in the director of the ambulance and police car, the water works started. To be honest, it took me by surprised. I didn’t quite expect it to hit me like that. I really didn’t. But, it hit. Hard. I felt defeated. I felt sad. I felt mad. I felt disappointed. I felt anger toward my foot AND my stupid asthma. I felt cheated. And, to be completely honest, I even felt happy. Happy to be getting off my foot and happy to be able to stop and hopefully catch my breath. As I approached the ambulance, the EMT, a very nice young lady, was inside and started asking me questions. I was kind of sobbing, so it took me a little while to answer. I held up my finger, motioning to give me a minute while I tried to compose myself. She asked if I was okay and I think I just shook my head yes, then no. I finally muttered that I was having foot issues and I had asthma and couldn’t breathe. She asked again if I was okay and this time, still through my tears, I said, “Yes, but I can’t finish. I can’t go on. 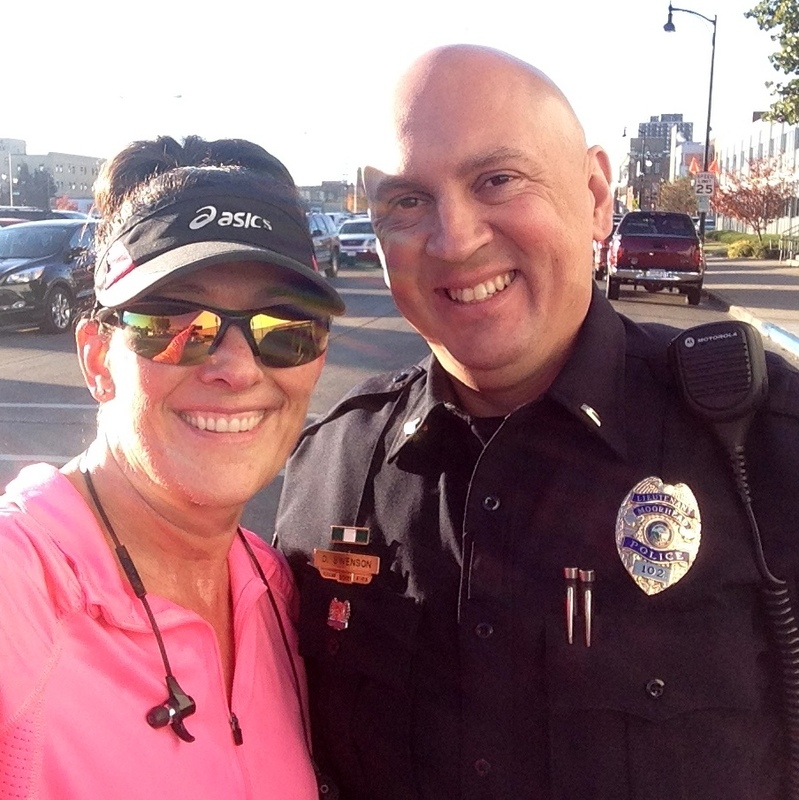 I have to quit.” The very nice police officer, who I later found out was Officer Deric Swenson of the Moorhead Police Department, also asked if I was okay. They probably thought I was a bumbling idiot and that it was JUST a race and why was I so upset. Which, to be honest, if that’s what they were thinking, they were right. It was JUST a race. My health is WAY MORE important. I knew that, but I ain’t gonna lie. It still hurt. Still hurts. We had a very nice chat on the way back and he even got me to laugh a few times. Unfortunately, I don’t remember much of the conversation because I was still sulking from having to quit. But I do remember he tried his best to make me feel better and he did. Thank you, Officer Swenson. When we got back, I told him that I better document this because it made for a great laugh and a great story and asked him to take a picture of me. I also asked if he wouldn’t mind taking a picture with me. He was SO NICE and took some pictures for me and with me. What a great guy! 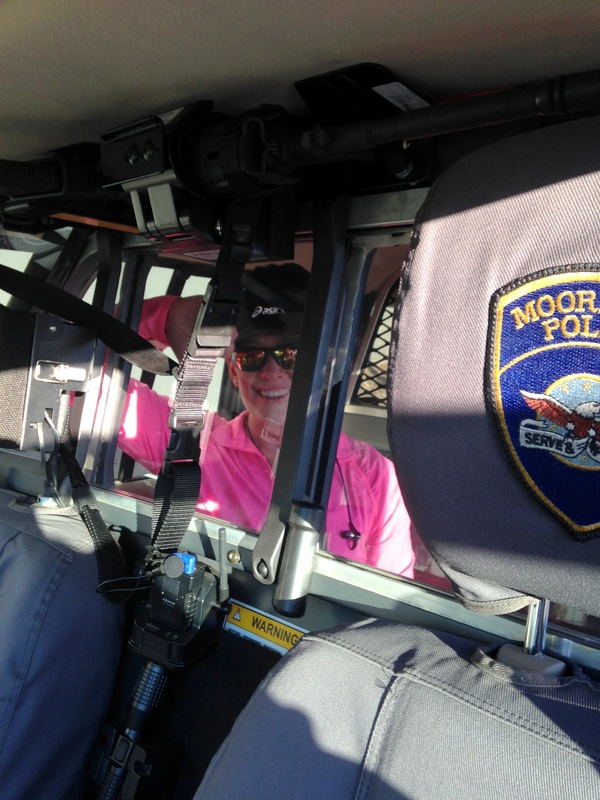 PHOTO: Officer Deric Swenson with the Moorhead Police Department. Thanks again, Officer Swenson. You’re a kind soul. I was going to go and sit in the car and sulk for a little more, but then I remembered that Al had the keys to the car. So, instead I found a nice quiet spot in the civic center to sit and think, to reflect and of course, to hop on Facebook and let my friends and family who were cheering me on know that I failed didn’t get to finish. PHOTO: Yep, this is me, teary-eyed, sulking and feeling sorry for myself. Can’t help it, I am big bawl baby. And that was’t the only time I cried. As soon as Al finished and we got to hug each other, the waterworks once again started. AND THEN, after we sat for awhile and were talking about it and he told be how brave I was and how proud he was, yep, one more time, there were tears. UGH! I hate being such a sap. A highlight to “finishing” before Al, I got to cheer Al on as he came in, which is always really cool. I love being able to do that. It is “almost” as rewarding as crossing the finish line myself. When he came across that finish line, I could tell he was beat. Tired. Drained. This was a hard one on him. But he did and he finished. His official time was 1:57:27. Not quite what he wanted but I think he was still okay with his time. It was his third best! Doesn’t matter to me, I am still extremely proud of him. 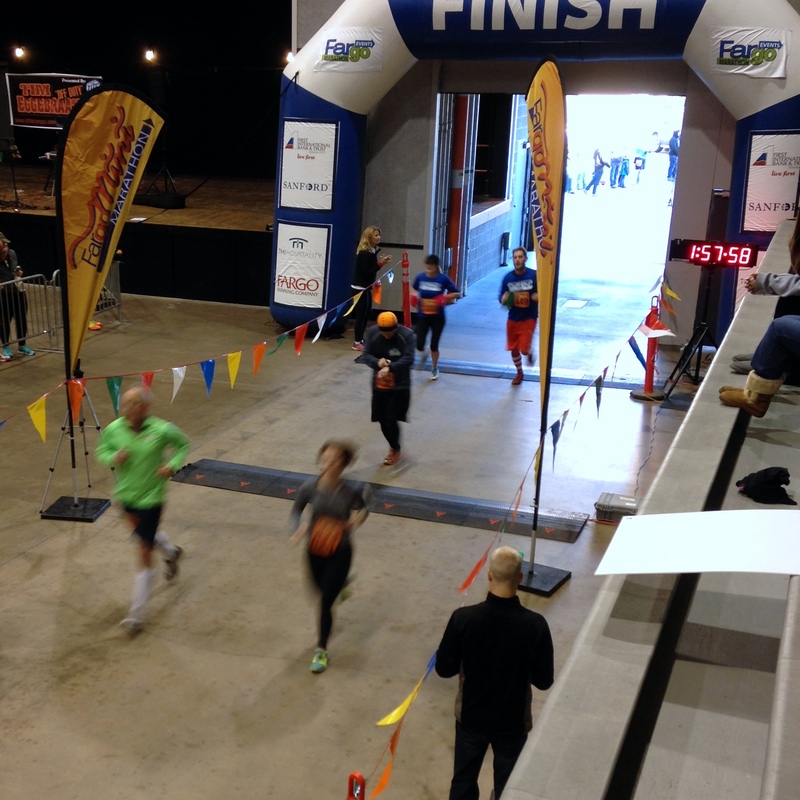 PHOTO: Al’s in the orange hat, just about to cross the finish line, hand on his watch! Way to go, Al! PHOTO: Us with our medals, which I thought were pretty cool. There are wooden leaves. And yes, despite not finishing, I still got my medal! After resting for a bit, Al and I wandered back into where the runners were finishing as I wanted to wait for an online friend of mine, Jenn, who I was actually going to get to meet for the first time. As another online friend stated in an Instagram post (more on that in a minute), “Being active on social media has opened up so many unexpected opportunities for me – like this friendship.” I couldn’t agree with her more. I have had the opportunity to meet and make friends with so many awesome people out there in cyber land and I have been fortunate enough to meet several of them in person. Today, at the race, even though it was for a very short period of time, I got to meet Jenn. Jenn has an incredible story and she is just amazing. Jenn and I are friends on Facebook and one of the things that I absolutely love (and I didn’t get to tell her this) is the posts she makes about her two sons. She will post little snippets of their conversations or her conversations with them and things she overheard them say and seriously, I crack up ALL THE TIME. 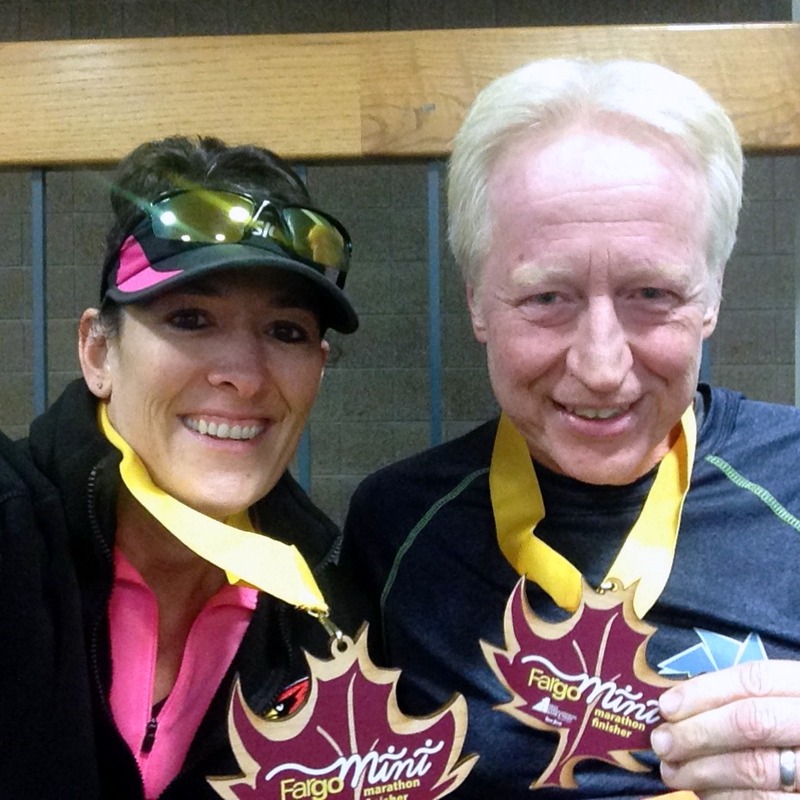 Awesome job on your half-marathon, Jenn! YOU DID GREAT! PHOTO: Jenn and I after she crossed the finish line. Seriously, who looks THAT good after running 13.1 miles? So glad we got to meet, even though it was a short visit. Until next time! 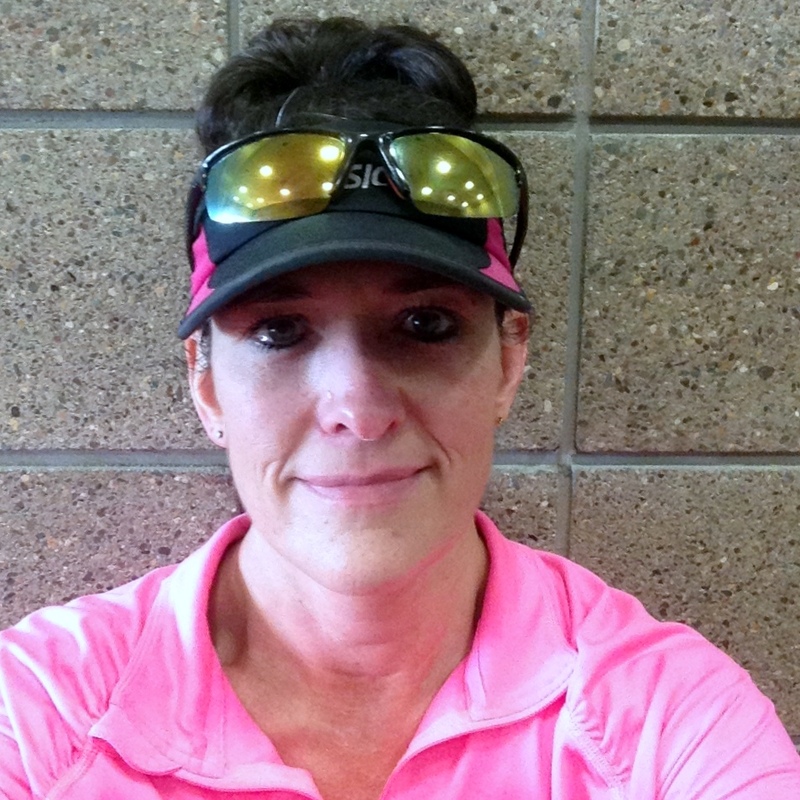 Please, check out Jenn and her story at her Facebook page, which you can get to by clicking HERE. After the race, Al and I headed back to our friends’ place. They were gracious enough to let us stay at their house even though THEY weren’t going to be there. How cool are they? VERY cool. Thanks Gary and DeAnn. We appreciated that more than you know. Al and I had plans to meet up with another one of my online friends, Sarah, who writes a blog called “Feisty Eats.” PLEASE take the time to check it out. You can do so by clicking HERE. Sarah and I have NUMEROUS things in common and we both agree that if we lived closer (she lives in Hazen, ND, which is about five and a half hours away), we would be great friends. I was so happy though, that we were able to finally meet. 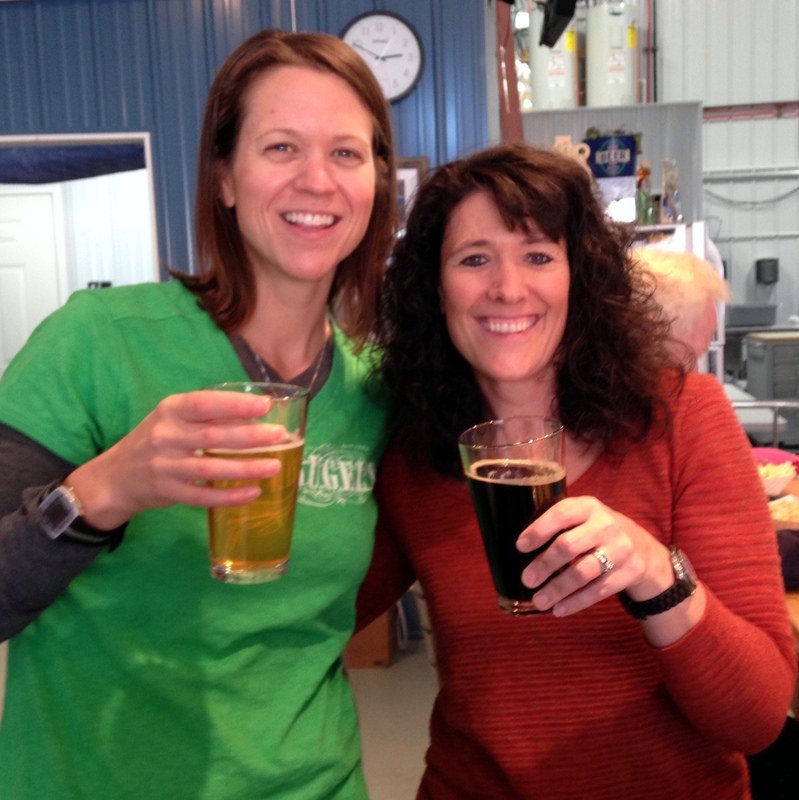 We decided to meet at Kilstone Brewing, a brewery and taproom. Both Sarah and I have a love of beer so meeting at a brewery was the perfect spot. PHOTO: Sarah and I enjoying our beers. Yes, she is THAT tall! It was SO MUCH fun to actually meet Sarah, who was brought there by her sister, Jodi, and brother-in-law, Bryon. It was great to meet them, too! I am thinking that Sarah and I could have sat there all night talking, laughing and having a great time. I can’t wait until we get to see each other again. And no doubt, it was be while we are sharing beers with each other at some local brewery! Thanks again, Sarah, for taking the time to visit with me. AND…..thanks for the awesome gifts. I wish I would have been as thoughtful as you. PHOTO: My gifts from Sarah. 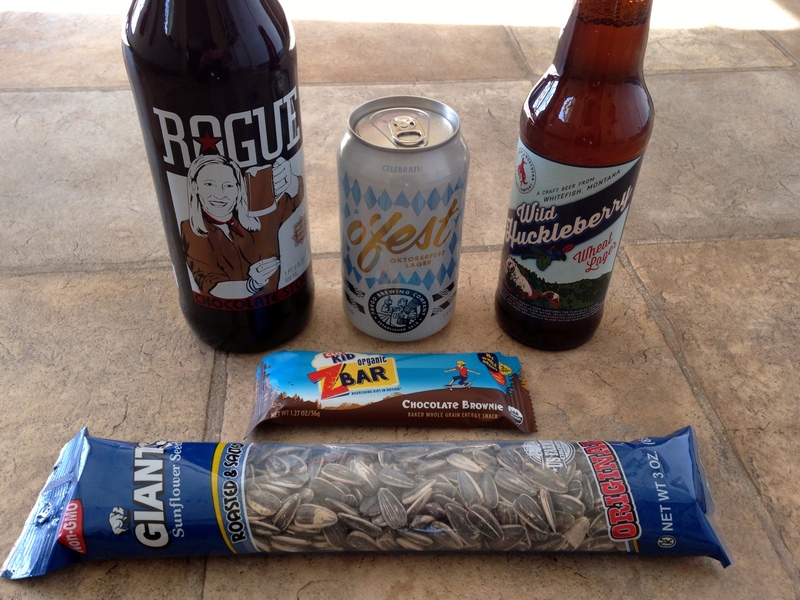 Three different types of beer because we both love beer, Giant Sunflower Seeds because they are made in Wahpeton, ND where my son is going to college, and her favorite protein bar. Seriously, is she not the greatest, most thoughtful person! THANK YOU AGAIN! After we all departed ways, Al and I decided to try one more brewery before we went back to Gary and DeAnn’s house for the night. It was Drekker Brewing Company, in downtown Fargo. Sarah had been here before and had made the recommendation so we decided to try it out. Oddly, Sarah and her family ended up going to Junkyard, another brewery that Al and I almost went to, but we decided to try out Drekker instead. See, Sarah and I think alike! 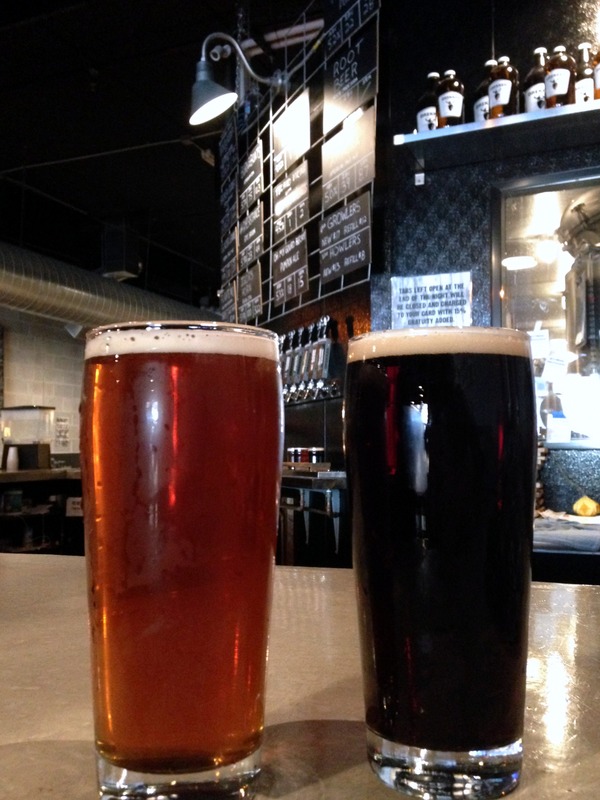 PHOTO: Our beers at Drekker. They did not disappoint. They were VERY, VERY good! After our one beer, we decided it was time to head back to the house. We were both shot. Al from running 13.1 miles and me from trying to run 13.1 miles. Plus, my foot needed some ice. Oh, I forgot to mention that before we went back to shower and change, I made one small little stop. I knew there was something that would cheer me up and it did just that and more! CUPCAKES! 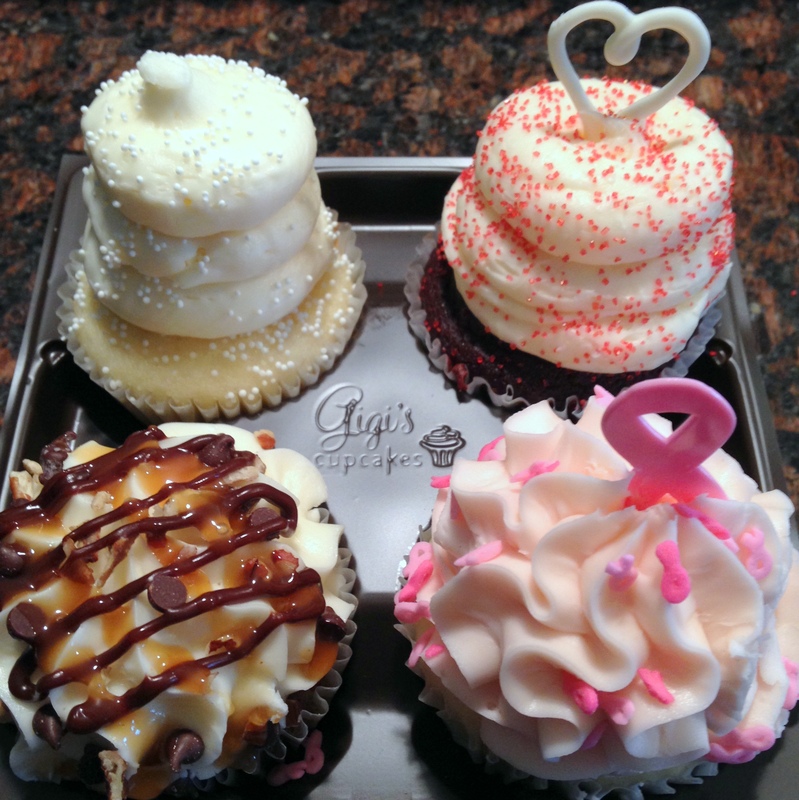 From Gigi’s Cupcakes. Can you say WOW! Yes, there were exceptionally good. And the frosting. OH, the frosting. Piled high, just like I like it! PHOTO: Starting at the front left, going clockwise – Kentucky Bourbon Pie, Wedding Cake, Scarlett’s Red Velvet and Birthday Surprise (decorated for Breast Cancer Awareness Month). Yes, there were as good – if not better – than they look. 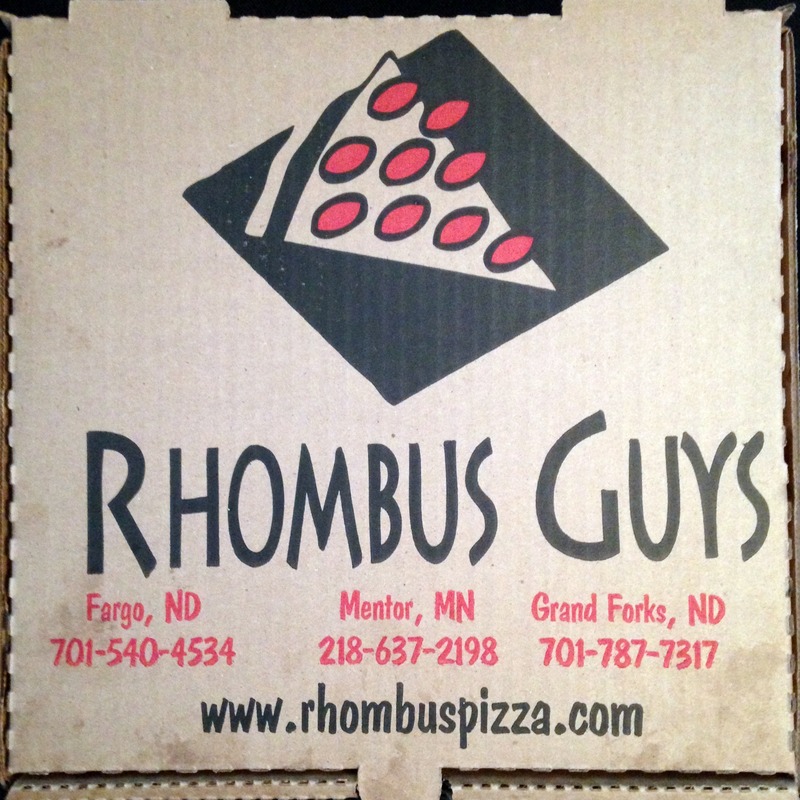 Okay, after we left Drekker, we decided we wanted pizza and we had heard about Rhombus Guys and that they were very good. So, Al looked them up on his phone and we decided to place a to-go order and bring it back with us so we could dine at home. Well, not our home. But our home for the weekend! Ummmm, yay, it was good. Really good. So good that I even forgot to take a picture of it. Besides the pizza, we also ordered breadsticks. And yep, you guessed it, they were just as good. I have to say there are in the top three of my favorite breadsticks of all time. Seriously, if you haven’t checked out Rhombus Guys yet, what are you waiting for. It is SO GOOD! PHOTO: Yep, all I got was a picture of the box. So, that pretty much sums up my day. Sucky to start, but ended up being pretty damn great. I guess pizza, beer, cupcakes and the company of friends and family can make just about any crappy day turn into a fun, memorable day filled with laughter and good times. Thanks again to everyone for making me feel better. You are ALL much appreciated. Next up……you WILL get to read about Amanda. Stay tuned! Love your recap, Celeste. Obviously not the outcome you wanted but what a fabulous day with friends, drinks & eats. It was my total pleasure to meet you & Al. I hope we can meet again for some more beer & visiting. Take care. I’m looking forward to following whatever your next adventure might be! 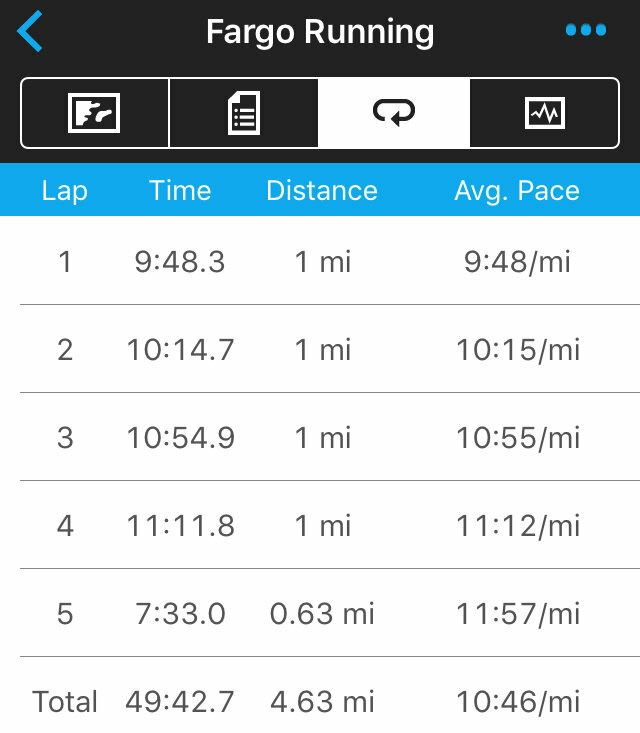 Previous Previous post: A five-minute PR. Onion Rings. Weight Watchers and more! Next Next post: It’s time to meet Amanda!